Jonathan Rieder is professor of sociology at Barnard College, Columbia University. He is the author of The Word of the Lord Is Upon Me: The Righteous Performance of Martin Luther King, Jr. and Canarsie: The Jews and Italians of Brooklyn Against Liberalism. He has been a regular commentator on TV and radio, a contributor to the New York Times Book Review, and a contributing editor for the New Republic. Rick Perlstein is the author of Before the Storm: Barry Goldwater and the Unmaking of the American Consensus, winner of the 2001 Los Angeles Times Book Award for history, and Nixonland: The Rise of a President and the Fracturing of America (2008), a New York Times bestseller picked as one of the best nonfiction books of the year by over a dozen publications. A former online columnist for The New Republic and Rolling Stone and former chief national correspondent for the Village Voice, his journalism and essays have appeared in Newsweek, The Nation, the New York Times, and many other publications. Perlstein has been called the "chronicler extraordinaire of American conservatism" by Politico and the "hypercaffeinated Herodotus of the American century" by The Nation. On August 5th, Simon & Schuster will release his new book called The Invisible Bridge: The Fall of Nixon and the Rise of Reagan. He lives in Chicago and plays jazz piano on the side. The book release party for The Invisible Bridge will be at the Seminary Co-op Bookstore on Tuesday, August 12th at 6 PM. The following night, Wednesday, August 13th at 6 PM, he will discuss The Invisible Bridge with Garry Wills at the Harold Washington Library Center. 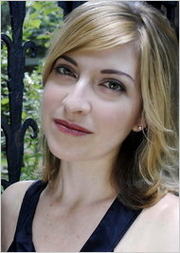 Julie Orringer is currently considered a "single author." If one or more works are by a distinct, homonymous authors, go ahead and split the author. Julie Orringer is composed of 3 names. You can examine and separate out names.